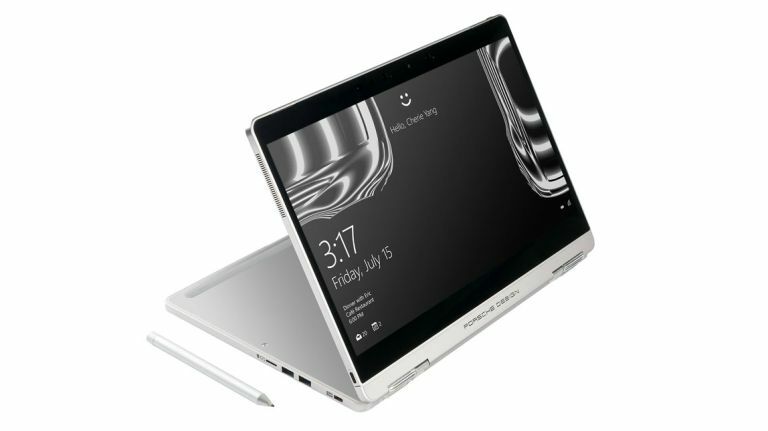 Porsche Design Book One hybrid revealed - but would you be better off with a Surface Book? Porsche Design has revealed its first foray into 2-in-1 space at Mobile World Congress 2017 (MWC 2017), the Book One, a hybrid computer that has been designed to "enable the best of Windows 10 Pro." 10 best Windows 10 laptops, tablets and 2-in-1s: which one is right for you? The Porsche Design Book One comes packing specification, which is the only available: a 3GHz Intel Core i7-7500U CPU, 16GB of RAM, a 512GB SSD, 5MP front camera and 13.3-inch, 3,200x1,800 pixel, QHD+ IPS display. Battery life is rated at 14 hours, while in terms of connectivity, the system comes with an Intel Thunderbolt 3 port, single USB Type-C port and brace of USB 3.0 ports. In terms of build, the Book One uses a milled aluminium housing with a matte anodized surface finish, while the screen's hinge is capable of a full 360 degrees of rotation. A digital stylus is also included with the computer and it has been optimised for use with Windows Ink. Lastly, the Book One's 5MP camera is fitted with an infrared sensor, which allows secure and fast login by facial recognition using Windows Hello. The Porsche Design Book One was confirmed to launch in April 2017 at a retail price of £2,395. For more information about the Porsche Design Book One then check out Porsche Design Computing.